DESCRIPTION (from the Official FB Page): Puzzle Pets Adventure is a strategic puzzle game to use pets to go for battle to challenge other players all over the world. Play and battle with friends now! This is probably going to be the nth time that my portfolio has moved domains, from Coolay.com to Skysenshi.com to Sarimanok.ph. Now it’s back again at Skysenshi, except I gave it a subdomain of its own. Funny that I should be relocating it again when I haven’t even updated it with the last two games I produced. 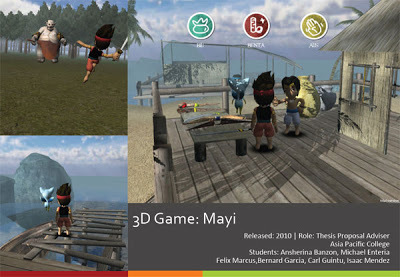 ASIA PACIFIC COLLEGE – This is a continuation of the previous post about April 2’s MAPROD: Game Design and Development defense. Last time we featured Albanya, the second group that presented. This time, we’re featuring Roots, a Western role-playing game set in a steampunk world. This was created by S-21 Labs, the first group that presented during the defense. senshi.labsAn incubation ground for the research and development of educational and entertainment multimedia projects. The Hermitage of Dr. Sky SenshiA kikay geek's hobby blog. An absent-minded professor's journal. The Otaku FridgeAn anime-gamer's fan guide. For fans by fans.